The vacant storefront where All Souls will locate. Photo by the author. 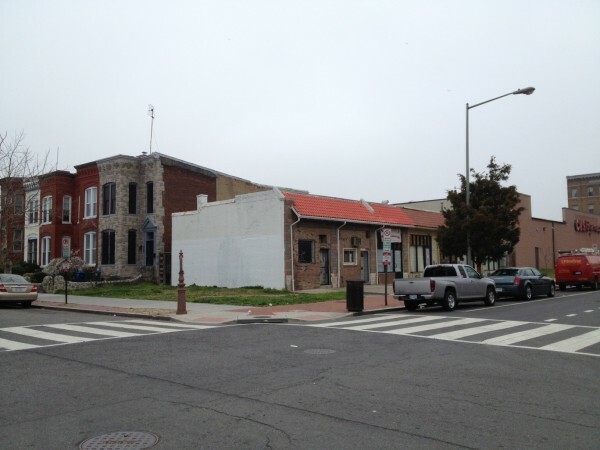 The Alcoholic Beverage Control (ABC) Board will grant a license for All Souls, the proposed restaurant to occupy the long-vacant storefront at 725 T Street NW in the Shaw neighborhood. While most liquor license applications face protests over noise and trash, several residents had objected on the grounds that children at the school across the street would be harmed by merely viewing adults consuming alcohol. The objection seemed like a quaint, Puritanical reaction incongruent with a diverse, secular city. All Souls thus became a lightning rod for unexpected opposition in March, drawing crowds and TV news coverage to its liquor license hearing. Long before the hearing, however, the proprietor agreed to only serve alcohol inside and only serve after 5 pm. within 400 feet of a public, private, or parochial primary, elementary, or high school; college or university; or recreation area operated by the District of Columbia Department of Parks and Recreation (DC Code §25-314(b)(1)). The existence of Mesobe within 400 feet of the school provides a precedent that satisfies the exception for All Souls, the board decided in its ruling. walking through neighborhoods with large concentrations of liquor-serving establishments during the daytime, such as Adams Morgan and U Street. There are a few important lessons from this case. The most important is that District boards don’t always cave to the flimsily argued demands of a vocal few. A common complaint, especially among the business community, is that DC’s various boards, such as Zoning Commission, the Board of Zoning Adjustment, the Historic Preservation Review Board (HPRB), the Old Georgetown Board, the ABC Board, etc., exercise their discretion in ways that are too often inconsistent or outright bizarre. Time and time again, neighbors use the historic preservation design review process to object to the size of the project rarely out of any genuine concern for the preservation of the neighborhood’s historic character but rather because they simply just don’t like the project. The basis for the complaints would be no different than if the project were in a brand new development with no historic character: it blocks my view, it’s too big, you’ll be able to see into my garden, et cetera. In the All Souls case, the school proximity argument failed to establish harm to students to a degree that would warrant killing off a fledgling local business. It is a non sequitur to many people that children are harmed by catching a glimpse of adults across the street sipping wine at 5 pm. Merely believing that something is true doesn’t necessarily make it true. In rejecting this claim, the ABC Board rightly stood firm in the factual evidence presented to it. The entire licensing process, which was unusually protracted in this case, certainly cost the proprietor of All Souls a hefty sum in legal fees. When the proprietor attended community meetings on his proposed license, he usually had his attorney with him to address the fine legal distinctions, especially as it applied to the somewhat complicated 400-foot rule. In fact I pitied the man. All he wanted to do was open up his small businesses. His modest license request unleashed the histrionic vitriol of a few strident Furies who spoke as though he were defiling the sanctity of childhood itself! The board ratified a voluntary agreement between All Souls and three neighbors uninvolved in the school-proximity protest. The text of this side agreement is not currently available, but if it is like most other voluntary agreements, it likely negotiated closing hours and restrictions on indoor music volume, not moral arguments about child psychology and societal vice. For all the complaints about DC’s regulatory bodies, the regulatory system worked rationally in this case. The board ratified the agreement with the neighbors willing to compromise. It rejected outright the protest of people who refused to believe the business should even exist. The good news is that even the opponents who lost their case actually won. Cleveland Elementary School is a great school and will continue to be a great school long after All Souls has poured its inaugural beer. The conversion of the vacant storefront into an occupied business will deter the loitering and drug-dealing along that block of T Street and will remove a visible physical blight from the neighborhood. The neighborhood and the school will both be better off once All Souls opens. What DC Streetcar station is between 15th St and Oklahoma Ave on the H St/Benning Rd Line? Feel free to ignore station subtitles.